Gemcitabine and Carboplatin Chemotherapy – Leaflet! This leaflet provides information on a course of chemotherapy called gemcitabine and carboplatin. The leaflet will explain what this is and when and how it will be given. It will also tell you about common side effects that you may experience. Contact telephone numbers and details of how to obtain further information on this chemotherapy are given at the end of the leaflet. This leaflet should be read alongside the ‘General information for patients receiving chemotherapy’ leaflet. If you haven’t received this leaflet please ask your nurse for a copy. What is gemcitabine and carboplatin chemotherapy? Why am I having gemcitabine and carboplatin chemotherapy? Your doctor has prescribed this chemotherapy because it has been found to be effective in treating your type of cancer. How often will I receive my chemotherapy? For this treatment to be most effective it is given at specific time intervals. These intervals are known as cycles. It is usual to have a cycle of carboplatin and gemcitabine every four weeks for up to six cycles. Your doctor will discuss with you the exact number of cycles you will receive. In each cycle you will receive chemotherapy twice, these are known as day 1 and day 8 treatments. The gemcitabine is given on both day 1 and day 8. Carboplatin is given on either day 1 or day 8. Your doctor or nurse will explain this in more detail. How often will I have to visit the hospital? Clinic appointment – at this outpatient clinic appointment you will have a blood test and you will be check how you are feeling and discuss any problems you may have. This is so that you can checked how the chemotherapy is affecting you. If your blood results are satisfactory, your chemotherapy will be prescribed. This appointment is usually a few days before your chemotherapy appointment. If you live far away your chemotherapy may be arranged for the same day as your clinic appointment. There is always a delay between seeing the doctor and being given your chemotherapy. If your chemotherapy is on the same day as your clinic appointment you should expect to be in the hospital for between four and eight hours. Day 1 chemotherapy appointment – you will spend up to 1½ hours in one of the day case treatment areas. Please allow 30 minutes longer for your first visit. You will be given anti sickness medicine and your chemotherapy, you may neither feel sick nor be sick, I wasn’t, but it may be a good idea to take the tablets anyway as they can do you no harm and its a bit late to take it once sickness has started! Day 8 chemotherapy appointment – You will need to allow 2 – 3 hours for this visit. You will have a blood sample taken. The result will be checked before pharmacy can make your chemotherapy. We will give you anti sickness medication and your chemotherapy. How will my chemotherapy be given? Your chemotherapy is given through a drip into a vein in the back of your hand or arm. Alternatively it may be suggested that a fine tube called a PICC is inserted into one of the large veins in your upper arm. This line can remain in place for the whole of your treatment. Your doctor or nurse will discuss this further with you. 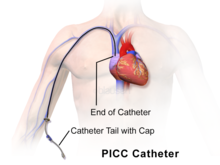 A PICC line (peripherally inserted central catheter) is a long, thin, flexible tube known as a catheter. It is inserted into one of the large veins of the arm near the bend of the elbow. It is then threaded into the vein until the tip sits in a large vein just above the heart. There are a number of possible side effects which can occur with this chemotherapy. The doctor, nurses and pharmacists can give you advice or answer any questions you may have. You should not lose your hair with this chemotherapy. However, a small number of people experience some hair thinning. We have a leaflet that tells you more about coping with hair loss. Please ask your nurse for a copy. Nausea and vomiting are uncommon these days as we will give you anti-sickness medicines which are usually extremely effective. If you are sick more than once in 24 hours despite taking regular anti-sickness medicine, you should contact Velindre Cancer Centre for advice. The telephone number is on page 7 of this leaflet. You are at an increased risk of picking up infections because your white blood cells which help fight infections can be reduced by this treatment. Contact Velindre Cancer Centre immediately if you develop any signs of infection, for example flu like symptoms or a temperature above 37.5°centigrade. The telephone number is on page 7 of this leaflet. Diarrhoea is not common with this chemotherapy. However, if you have four or more bowel movements in 24 hours above what is normal for you please contact Velindre Cancer Centre immediately. The telephone number is on page 7 of this leaflet. Chemotherapy can make you feel more tired than usual. It is important to listen to your body and rest if you need to, but carry out your normal activities if you feel able. Some people find it beneficial to take gentle exercise as well as taking rest. Your mouth may become sore or you may notice small ulcers. Please follow the advice on caring for your mouth in the general chemotherapy leaflet. Your doctor may prescribe mouthwashes or medication to prevent or clear any infection. Approximately 20% of patients may experience flu like symptoms in the first 48 hours following gemcitabine treatment. This is usually mild and short lived. Symptoms may include fever, chills, muscle aching, headaches and tiredness. If your temperature is above 37.5oC please contact Velindre Cancer Centre immediately. The telephone number is on page 7 of this leaflet. Gemcitabine may cause an itchy rash in some patients. Medication is available to treat this so please tell your doctor or nurse if this occurs. You may also notice some swelling of your ankles. This is usually mild and will stop when your treatment is completed. A small number of patients experience an allergic type reaction to carboplatin. If this occurs you may feel hot or flushed, itchy, light-headed or generally unwell whilst receiving your carboplatin. This can be easily treated. Please tell your nurse immediately if you experience any of these symptoms. Some patients experience some discomfort along the vein when gemcitabine is being given as a drip. This problem may occur more frequently as you have more treatments. Having a PICC line inserted will prevent this problem from occurring. If you would like more information please speak to your nurse or doctor. Women sometimes find that chemotherapy treatment can affect their periods. They could become heavier, lighter or even stop altogether. It is important you do not become pregnant or father a child whilst having chemotherapy treatment as chemotherapy could damage the unborn baby. Copies of drug manufacturer’s patient information leaflets are available from the Velindre Pharmacy, or on the internet at www.medicines.org.uk These leaflets provide detailed information about individual drugs. They are not given out routinely as they do not usually provide information on combinations of drugs, and can be difficult to read. Please ask if you would like a copy. This leaflet was written by health professionals. The information contained in this leaflet is evidence based. The leaflet has been approved by doctors, nurses and patients. It is reviewed and updated annually. You may well find the additional, very diagramatic presentation of ‘Chemo & its side effects’ which you can find at CLICK HERE of further help – there are various similar examples shown both on and attached to other postings on this web site and postings I have made. You are also welcome to call me, if you feel I may be able to help – minded that I am NOT medically trained – as I have now (Dec-2015) had cancer of various types since presenting with symptoms in Nov-1997. This entry was posted in Adverse effect, Cancer, Carboplatin, Drugs and Medications, Gemcitabine, Pharmacy. Bookmark the permalink.